This thread was initially about creating an updated version of Unofficial SP5. However, for various personal and technical reasons, I was unable to follow my original plans. 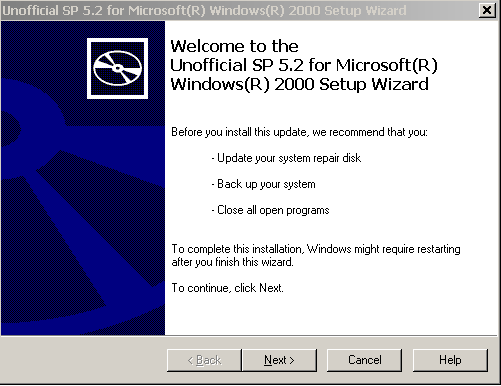 @Gurgelmeyer, the author of the USP5, used an automatic tool to update the official Service Pack 4 with updates and hotfixes that were released by Microsoft after it. The tool was never shared to the public though, so I began with preparing my own scripts that would do the same work. Yet, I have never gone far enough to be able to integrate the updates into SP4 the same way that he did. Nevertheless, my scripts were still able to merge single updates into so called "update rollups", so I decided to use them to create unofficial packages such as UURollup, Update Rollup 2, HBR Rollup and many others. At that time, I suddenly became responsible for the Updates Lists for HFSLIP for Windows 2000. I had to learn HFSLIP not only from the outside (as a user) but also from the inside (as a maintainer), and also learn how to build and administer a website. In the process I realized that producing more and more small unofficial packages was a dead end. Despite the initial success, they inevitably introduced new bugs and issues that were difficult to track and fix, led to even greater fragmentation of the Windows 2000 update ecosystem and, most importantly, required continuous and active maintenance. In such a situation, I made my mind to fully focus on the Updates Lists with HFSLIP as the ultimate tool for keeping Windows 2000 up-to-date. Everything has been said about HFSLIP (see the HFSLIP forum and my website) so I am not going to elaborate it here. There are at least three reasons why I believe that HFSLIP, despite its limitations, is still better than all other similar tools or prepackaged updates (such as USP5 or unofficial rollups). Firstly, it is a complete program that just works in spite of no active development. It does require small fixes from time to time, but most of them can be done even by a novice developer like myself. Secondly, thanks to its flexibility, HFSLIP is the only such tool able to integrate a large variety of differently structured updates, system files, registry files, addons, any many other packages. Lastly, it supports all language versions of Windows (which is not the case with the majority of the unofficial update packages which are usually English only). All in all, this is how my current point of view stands. The thread itself is old and long, any many things have changed since its creation. Accordingly, many different topics have been discussed here. Since I have discontinued all the other threads related to my work with Windows 2000, feel free to use this one to post your opinion, questions and suggestions on the current and future development of everything related to Windows 2000. The thread's original content is still available in the spoiler below.